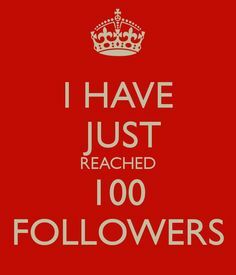 I officially hit 100 followers! WAHOO!!! This may not be big news for many of the other bloggers on here- but for me this is EXCITING! How should I celebrate? Typical glass of red wine at the end of the day? Some champagne so that I have a headache and a slightly giddy nausea for next couple of days? OR- be a good girl and after work today go home make a healthy dinner and chase it with a nice long run? A victory lap of sorts? HMMMM. The choices are endless. As long as they don’t make me hung-over. Or cost any money. Or take up TOO much time. I hope to continue this journey of silliness with all of you, and hopefully add enough new followers to be able to celebrate milestones on a semi-regular basis. Thank you all for not only stopping in but continuing to follow me in all of my random, weird glory. Much love! Looks like I am not the only one that gets excited about this! Previous Post What sort of depraved cretin steals someone else’s breakfast? Congrats!…it’s a great milestone…and the only way is up! Way to go!! And love the typewriter too! Thanks, I hope you are right! And how can someone be such a kill joy?